Intensity-modulated radiation therapy (IMRT) technique requires detailed verification of the multileaf collimator (MLC) leaves position , because geometric discrepancies between planned and actual beam segments affect the treatment quality, as demonstrated in literature both in terms of spatial and dosimetric errors. For this reason, controls should be performed to verify leaves and jaws settings when using several small fields, both during acceptance and subsequent controls. Sharpe et al.,  demonstrated that largest output factors differences are seen when the actual field size deviates from the set field size: e.g., the measured output can vary by as much as 16% for 1 × 1 cm 2 field size compared with 10 × 10 cm 2 , when the measured field size deviates from the set field size by 2 mm. For 1 mm deviation, this discrepancy was reduced to 8%. These checks can be performed with different types of detectors, such as diodes arrays, ionization chamber arrays, electronic portal image devices (EPID), or radiochromic films. Gafchromic ® films (International Speciality Products, Wayne, New Jersey) have a wide use for dosimetric purposes in radiotherapy applications. Many studies on the use of radiochromic films for dosimetry in clinical photon beams for the implementation or verification of IMRT technique was performed. ,,, Majority of these works used Gafchromic ® EBT films and subsequent upgrades; high spatial resolution is their most important feature. The RTQA films also represent a valid detector to realize quality assurance (QA) on beam parameters: Thomas and Warrington  found that it's possible to determine the position of field edges using RTQA films and a flatbed scanner. The usefulness of Gafchromic ® RTQA2 as a tool to implement a reproducible protocol for quality control (QC) on leaf positioning accuracy in MLC, both quantitatively and qualitatively, was evaluated in this investigation. A reading protocol was created to study the properties of the system made up by the Gafchromic film and the flatbed scanner; system reproducibility and sensitivity were explored. A flatbed scanner Epson Expression 10000 × L (Seiko Epson Corporation, Nagano, Japan) was used to evaluate the film response. Scanning was done using the SilverFast Epson IT8 software with the "scratch and dust removal" filter; the resolution was 75 dpi that provides a pixel dimension equal to 0.34 mm. The films were scanned in the 48-bit RGB mode (16 bits per color) and saved as tagged image file format (TIFF) image files. The option "multiscan" to obtain the mean value of scans was used. To determine the optimal number of scans of the same film that minimize statistical noise, images that are the result of the average of 1, 2, 4, 8, and 16 scans were analyzed: as reported by Devic et al.,  repeated film scans significantly reduce uncertainty in the gray levels values and this was minimal when the film was digitized four times. Increasing the number of scans deteriorates the accuracy: the flatbed scanner is equipped with a xenon gas cold cathode fluorescent lamp that remains on during scanning phase and increases the temperature of the transparent glass plate and consequently of the film. For this reason, it is recommended to limit the number of consecutive scans to minimize changes in Optical Density (OD) caused by film heating. To define a reading protocol for our system, warm-up, prescan effect, definition of a working area (both inside the film and the scanner bed), and spatial calibration accuracy were explored. In fact, as reported by Lynch et al.,  warm-up effects are common and can lead to a variation response up to 7% for acquisitions done at different scanner bed temperatures. Moreover, also the scanner response as a function of document position and the spatial calibration accuracy was evaluated, as suggested by Thomas et al. Several factors invalidate measurements accuracy, such as setup errors during the scanning phase and variation of films response within the same batch. To ensure the reproducibility during the irradiation phase, the center of each film was marked before irradiation. The films, belonging to the same batch, were irradiated at known dose levels with 6 MV photon beam delivered by a commercial linear accelerator (Synergy Elekta Platform, Elekta, Stockholm, Sweden) to obtain sensitometric curves in comparison with a ionization chamber (Farmer FC65-P, IBA Dosimetry, Louvain, Belgium). Several 3 × 3 cm 2 square fields were used and the calibration doses ranged from 20 cGy to 10 Gy. The detector was placed in a solid water (SW) phantom at a depth of 5 cm and with source surface distance (SSD) of 95 cm; gantry angle was equal to 0° (reference conditions). RTQA2 films were irradiated at the same conditions. This procedure was repeated twice with a different film to check repeatability of calibration method. The films were scanned and the mean value and the standard deviation were obtained by selecting an elliptical region of interest (ROI) with radius 1 cm within each irradiated area. 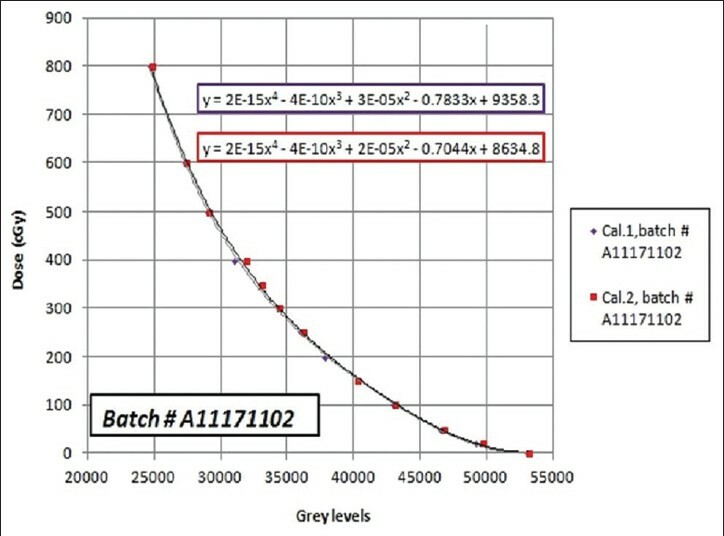 The conversion curve between gray levels and dose was obtained by using a program developed with MATLAB; a median filter 5 × 5 was applied to each digitalized image. Because the absorption spectrum of the RTQA2 films exhibit a maximum in the red region of the visible spectrum, as stated by manufacturer, extraction of the red channel from the RGB image can improve document scanner sensitivity. Therefore, the dosimeters were calibrated only on the red channel. Moreover, two non-irradiated RTQA2 films were scanned and the mean value was taken at the center of each films as the background dose levels for the entire batch. The medical linac tested for this project was an Elekta Synergy Platform equipped with a 40 leafpair MLC, each with a width of 1 cm at isocenter. The great majority of 3D treatments and all the IMRT fields use the MLC to conform the field to the target volume and to create segments: checks must be performed to verify that the MLC leaves positions match with the set positions, with a tolerance of 1 mm (in accordance with Elekta protocols). For this purpose, a QA procedure using Gafchromic ® RTQA2 films was designed and developed: it consists of three different tests to evaluate MLC leaves position. All fields were defined with our Treatment Planning System (Oncentra MasterPlan, Elekta) and delivered to the linac treatment console via the record and verify system (Mosaiq, Elekta). A rhomboidal field having axis dimension equal to 22 cm was selected to exclude backup collimators from the irradiated area. The film was irradiated at isocenter in the reference condition and scanned with 24 h delay as recommended by the manufacturers. A program in MATLAB environment was developed to analyze the data. Each pixel is represented from three coordinates (X, Y, D). X and Y coordinates are the leaf aperture and the distance respect to the central axis, while the D coordinate is the dose value. The software normalizes doses to the central axis absolute value; 22 horizontal dose profiles were analyzed at each leaf center. A linear fit of percentage dose levels was performed to improve accuracy in coordinates evaluation. The measured X value were compared with the set one and the tolerance value of ± 2 mm was adopted according to Elekta acceptance test. Two films were irradiated to investigate reproducibility and uncertainty of the method; the results obtained were compared. In every IMRT treatment plan, each field is composed by a variable number of segments and the leaves may reach every allowed location in a range, according to MLC characteristics, including overtravel positions. A test to check the leaf position accuracy for MLC was developed by Chui et al.,  : it consists of three rectangular segments 5-cm wide and 22-cm long, with the central axis at 0 and ± 7.5 cm off-axis, respectively, delivered in sequence on the same RTQA2 Gafchromic film. The jaws were excluded from the field. The irradiation conditions were the same used during the film calibration. Dose profiles in the direction of leaf movement, evaluated at 50% of the normalized dose, provide information on leaf position and leaf bank alignment over the entire field. The acceptable leaf position accuracy is ± 1 mm. Our reading protocol contemplates the following solutions: the scanner must be switched on 10 min before using and five prescan must be performed (warm-up). The digitizer should be turned off after the scanning phase to prevent excessive heating of the instrument. The reduction of the working area both inside the film and the scanner bed is useful to improve the scanner response. Multiple scan were performed to reduce uncertainty and this was minimal when the film was digitized four times and a non-reflective mask was placed on the film during the scanning phase to minimize the statistical noise. Moreover, spatial measurements are more accurate if performed along the reading direction of the charge-coupled device (CCD) sensor. The calibration curve was obtained by irradiating a RTQA2 film at different dose levels in the same conditions. Two films belonging to the same batch were irradiated to investigate the repeatability of this procedure. The percentage standard deviation varies between 0.2 and 0.7% for dose step ranging from 20 cGy to 8 Gy. The two sets of data were fitted with two different 4 th degree polynomial equations. Similarly to what reported by El Barouky et al.,  the curve gradient tends to decrease after 150 cGy, as shown in [Figure 1]. If we suppose to split in two parts the curve (first one composed by the points ranging from 0 to 150 cGy and the second one by the points from 200 to 800 cGy) and to perform on both a linear fit, we obtain an angular coefficients ratio approximately equal to 3.6. 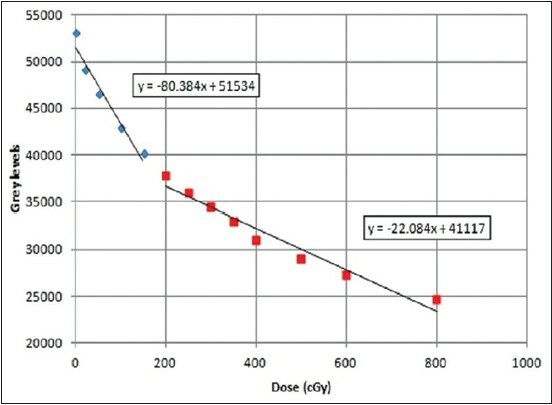 This means that the accuracy in dose determination is better with dose higher than 150-200 cGy. Therefore, we chose to expose our films at 300 MU (i.e., about 300 cGy) for all further studies. 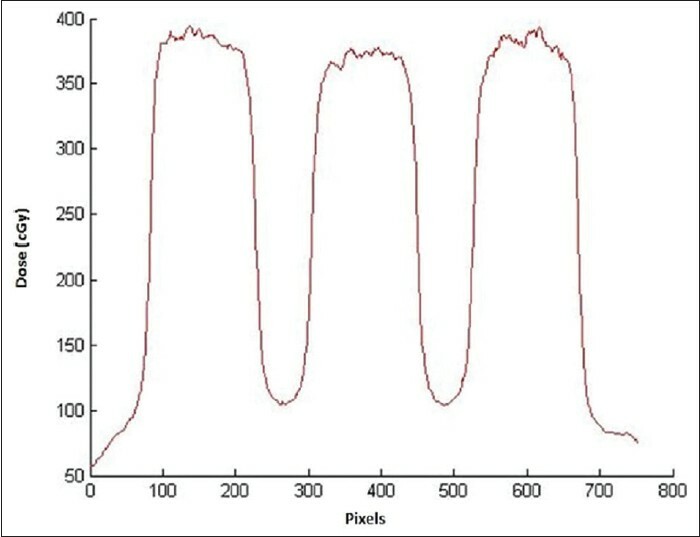 As shown in [Figure 2], calibration curves obtained by two different films show similar results: the best fit was a 4 th degree polynomial equation with R 2 coefficient equal to 0.999. The comparison of two curves also underlines the repeatability of the method. where R i is the detector spatial resolution, equal to the pixel size (0.34 mm). R setup is a random error: it is influenced by positioning of MLC leaves and by management of the films (irradiation and digitalization phase). To determine an indicative estimate about R setup , two RTQA2 films were irradiated with the same rhomboidal field; leaves positions were evaluated for each film and the maximum difference found was taken equal to setup indetermination. The evaluation of overall results to be 0.6 mm, according with Romani et al.,  which estimated a global uncertainty of 0.5 mm. In routine QCs, positioning errors were divided into two categories: attention values ​​, ranging from 1 to 1.5 mm, and out-of-tolerance errors, equal or greater to 1.5 mm. The data analysis via software allows a quick readout through the use of different colors. This procedure was used both in the evaluation of MLC leaves positioning and in the determination of field width in overtravel conditions. The differences between measured and expected positions ranged between 0.07 and 1.03 mm in the first film and 0.01 and 1.14 mm in the second one, respectively. An important result comes by the check of the correct positioning of the film within the scanner: Performing a scan with the film positioned in contact with the upper side of the scanner bed provides leaf position values greater than those that are obtained by placing the film within the working area previously defined. This effect is visible only for the first four upper leaves, and it is therefore advisable to place the film centrally on the scanner bed. In this way, we obtain a good reproducibility, evaluated irradiating two films: The average reproducibility for each leaves pair was about 0.5% and the average difference between the real position and set position did not exceed 0.14 mm. Moreover, the repeatability is also good relative to the signs of the differences between expected and measured field width: In fact there is agreement with the shifts detected, except that in three cases, in which, however, the differences are always contained within a pixel. Evaluation of leaf positioning for overtravel fields provides results in agreement with expectation; the FWHM analysis provides results within the tolerance range of 1 mm, with values included between 0.01 and 0.76 mm and mean value equal to 0.28 mm. Moreover, when present, the positioning errors are divided into two categories previously identified; [Figure 3] shows FWHM profiles for test in overtravel conditions control. 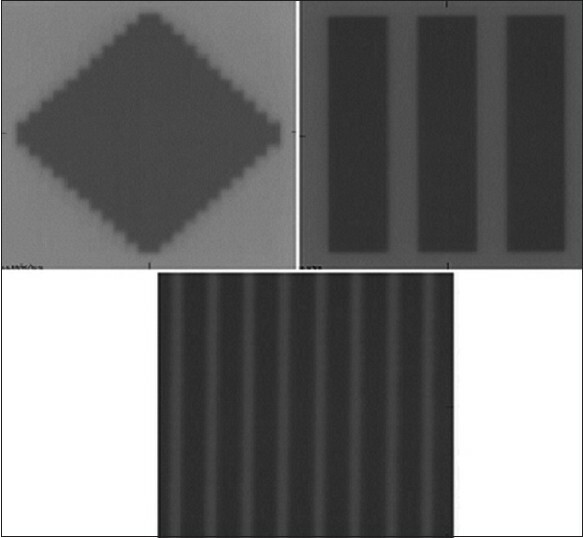 The analysis of the film irradiated with a picket fence pattern shows that in both irradiated films the shifts are easy detectable at visual inspection. [Figure 4] displays the different patterns used to perform the QA protocol. In this work, we explored the use of Gafchromic ® RTQA2 model as an instrument for MLC QCs, not only qualitatively, as stated by manufacturer, but also quantitatively, using a homemade program developed in MATLAB environment. Moreover, RTQA2 films represent an economical choice if compared with the more expensive EBT model, which remains the best option, regarding the films, for IMRT plans verification and in vivo dosimetry controls. The RTQA2 films offer reliable results both for qualitative and quantitative analysis to check leaf positioning accuracy and leaf alignment and can be used with confidence for routine QA. This work was fully supported through a study grant dispensed by the Foundation "Enrico, Umberto and Livia Benassi", Italy. 1. Ezzell GA, Burmeister JW, Dogan N, LoSasso TJ, Mechalakos JG, Mihailidis D, et al., IMRT commissioning: Multiple institution planning and dosimetry comparisons, a report from AAPM Task Group 119. Med Phys 2009;36:5359-73. 2. Société Française de Physique Médicale (SFPM) and Belgian Hospital Physicist Association (BHPA), Quality controls on multileaf collimators, Rapport S.F.P.M. n 20 - 2003. 3. Sharpe MB, Miller BM, Yan D, Wong JW. Monitor unit settings for intensity modulated beams delivered using a step-and-shoot approach. Med Phys 2000;27:2719-25. 4. Thomas G, Chu RY, Rabe F. A study of GafChromic XR Type R film response with reflective-type densitometers and economical flatbed scanners. J Appl Clin Med Phys 2003;4:307-14. 5. Chui CS, Spirou S, LoSasso T. Testing of dynamic multileaf collimation. Med Phys 1996;23:635-41. 6. Report AIFM. Intensity modulated radiation therapy (IMRT): Dosimetric and computational aspects. 2006;3. 7. El Barouky J, Fournier-Bidoz N, Mazal A, Fares G, Rosenwald JC. Pratical use of Gafchromic ® EBT films in electron beams for in-phantom distribution measurements an monitor units verification. Phys Med 2011;27:81-8. 8. Thomas MD, Warrington AP. Gafchromic RTQA film for routine quality assurance of high-energy photon beams. Phys Med Biol 2006;51:1439-47. 9. Devic S, Seuntjens J, Hegyi G, Podgorsak EB, Soares CG, Kirov AS, et al. Dosimetric properties of improved GafChromic films for seven different digitizers. Med Phys 2004;31:2392-401. 10. Lynch BD, Kozelka J, Ranade MK, Li JG, Simon WE, Dempsey JF. Important considerations for radiochromic film dosimetry with flatbed CCD scanners and EBT GAFCHROMIC ® film. Med Phys 2006;33:4551-6. 11. Romani F, Mesisca RV, Angelini AL, Gaiba W. Leaves positioning control of multileaf collimator using Gafchromic EBT2 films, Fisica in Medicina 2011;1:7-12.